Actually i got this from my Mother in law.This water is great remedy for stomach upset & indigestion.This water is not suitable for ulcer patients. Grind ginger & coriander seed in a blender with water. Add 1 cup of water & drain it. Add lemon juice, sugar & mix well. Drink half cup & feel better. 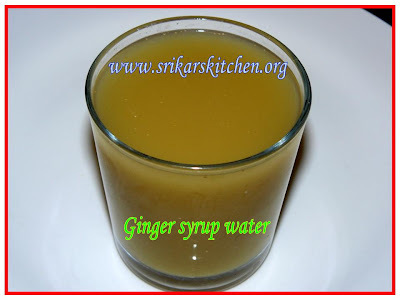 good one..its good to have this once every week..
wow..great recipe...my mom add little jaggery instead of sugar..lovely..
ginger syrup water too gud!very gud for health...Thanks for posting it. quick fix for indigestion(happens most of the time)...very handy. the remedy is a quick fix for stomach upset...very handy.Thanks!! Lovely water, thanks for sharing.. Very nice syrup. I used to make just with ginger,honey and water. My grandfather used to drink this often for stomach upsets. Love the color. A very helpful home-remedy! Thanks for sharing. wow..I would call it magic water..very useful info..do drop in sometime..
Thats a really healthy syrup water. I love ginger-honey-lemon juice. We have it in our drafts..
My mom too makes this the same way,except we add panang kalkandu or honey in place of sugar!